I don’t normally comment on contemporary clocks as I find they are all pretty much the same. This is because the movements available come from two manufacturers these days as opposed to the hundreds of the past. Modern clocks lack mechanical variation quite frankly and all run the same system. Imagine if BMW and Mercedes were all you could buy at the quality end the of the market and its a good analog of where clock making is at the moment. Theres only so much to say about a set range of engines that all do the same thing in the same way. There are however exceptions to this. Clock makers who go the extra mile and modify the movements, or in the case of this BilliB, extend its functionality with a new gear trains. You see, normally its quite hard to leech of torque for your own mechanical use. Where are you going to connect to the movement? Its not realistic to start boring holes in the plates and fitting new spindles. Its a customer warranty nightmare waiting to happen and will flatten your warranty from the manufacturer if you get into trouble. I would imagine this reason alone explains why you really dont see this in clocks built around the movements available. BilliB have aced this though I have to say. They have produced a set of extended wheels and functions mounted directly to the dial pan. The power from the movement is then split off via a canon pinion they have manufactured to fit over the movements canon pinion (in a fashion). Its a really clever idea that delivers plenty of power efficiently from low in the gearings power train. The mechanics are well done and BilliB have selected the best movement for the job. You do pay for this level of engineering but its worth it. The only thing I will say is that this particular machine was in for repair on a “no longer runs” brief from the customer. A quick diagnostic revealed little other than three broken clicks that needed replacing – Billib were kind enough to find some spares for me which are very hard to get hold of (thanks Richard). Its probably worth pointing out at this juncture that BilliB are not a parts vendor or stockholder, it was their favour to my client/their customer who I have to say only had good things to say about Billib despite being in the middle of a clock stoppage. So, the repair ….I checked the escapement pressure very little was getting through. It had not seized but really well under power by at least 75%. It has to be said at this point that the thing with Kieninger movements, specially the very top end units, is that they are finely engineered and susceptible to fouling from airborne particulates. They really are works of art for production units. Everything is thick and chunky where it needs to be and then fine and elegantly sprung where it should be. There is something hand built about them and I expect assembly is done by hand as there are several set points that I feel sure would need doing clock by clock (I could be wrong!). Back to the point, what that means is that they dont like dust or any level of air pollution. The pivots need oil and this oil picks up airborne dust over time. The helpful oil then turns slowly into unhelpful waxy black glue. On larger clocks and gearing systems this lubrication is not such a show stopper but on the very low powered fine top gear train pivots it… does stop the show. My point is that on a cheaper movement you can see evidence of this as a black residue in the pivot bushes. On a Kieninger it might stop the clock before you can see this evidence, as on the clock in the pictures below. The movement looked factory clean but a clean proved that this was not the case and the clock now confidently ticks along. I think a service interval of 5 – 7 years is what I would recommend on a Kieninger. The more enclosed and cased your clock is the slower it will acquire dust build up. Note the BilliB clock below has an open format without reasonably airtight enclosure. A clock like this will need servicing slightly more frequently than one of its enclosed cousins such as a Viennese regulator, but, Id still have this one. It really is a cracker. BilliB clock repair – clicks and clean! Halloween Expensive Horror Clocks – Clocks to be wary of. Nice Epping 1725 Brass Face – Service (!!) and Face Restoration! A Tiny Cuckoo Clock, How a cuckoo clock works and why, and why Loetscher Cuckoo Clocks are Brilliant. Part I – Gough Grandfather Clock Restoration C1690 – 1700. Servicing A Grandfather Clock – when and why. David Smith From The Quinpongfangdong province of China. Or India. Probably. Possibly the best mantle clock Ive seen…Grasshopper Escapement! Braintree Clock Repairs Is Going Global – Why not? 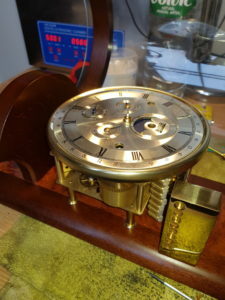 A Braintree Grandfather Clock Repaired! Worn carriage clock repair & a tip for dating carriage clocks and pocket watches. 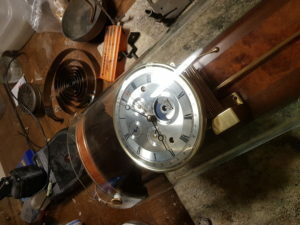 Redshaw Grandfather Clock Repair – Broken cat gut and dating the grandfather clock. Alan Turing Vs Early American Clocksmiths. (Clocks win). 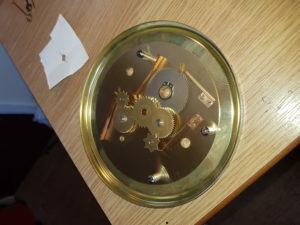 An unexpected clock repair that should have been done under the manufacturers warranty! German Lantern Style Clock – A repair article with a few tips on mending chimes.